Step 1: Tie your string around the top of the bauble so that you can easily spray paint it without having to get your fingerprints all over it. 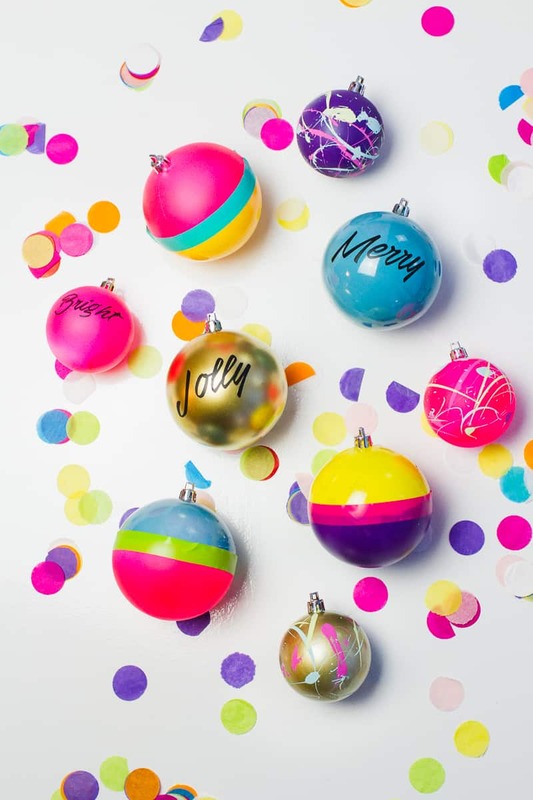 Step 2: Spray paint one solid colour around the entire bauble and allow to fully dry. Step 3: Upload your font templates to the Cricut Design space and set it to cut out on black vinyl, then peel off the design and stick firmly to the mug. Or alternatively if you’re handy with a sharpie you can draw on your text or even use stickers! Step 2: Next, using your masking tape and newspaper mask off the bottom half of the bauble making sure the spray paint won’t get to any of it. Don’t worry at this stage if the line isn’t perfectly straight because your vinyl will cover it up. Step 3: Spray paint the top half and allow to fully dry. Step 4: Do the same again but with the bottom half of the bauble in a different colour and allow to fully dry. Step 5: Finally, cut your vinyl in one long straight strip and wrap it around the middle of the bauble ensuring it touches both sides of colour. Step 1: Tie your string around the top of the bauble. Step 2: Spray paint one solid colour around the entire bauble and allow to dry. Step 4: Tie the other end of your string on something so that the bauble is suspended and isn’t touching anything that could smudge the paint.